Thailand Visa | Get 25% OFF For Thai Visa With Malik Express NOW! Thailand Visa - Apply Now & Get 25% OFF! Thailand visa services and assistance is provided by Malik Express, we are associated with travel and tourism industry for the last 27 years. The professional and well trained team of Malik Express is consistently in touch with embassies, consulates and other concerned departments. Hence, our expert staff members are well informed on the latest rules and regulations pertaining to visa requirements and provide visa services to our clients in line with local regulations. We offers you Thailand visit visa assistance at reasonable and affordable cost. Our visa experts personally manage the application process. We are here to provide you visa assistance in the easiest and quickest possible ways. We are glad to offer Thailand visit visa for Pakistani citizens. We carefully asses your application and guide you to provide all the required documents by the Royal Thai Embassy in Pakistan. Applicants can submit the Thailand visa application through any authorized representative. For all visa related services about Thailand visa in Pakistan our dedicated team is here to help you. Our professional agents will guide you through the visa procedures from start to end. If you are planning to visit Thailand on a visit visa and you are looking for information about other services, our team will get you the best rates for flights, accommodation, transportation and tours. For above services you are at a right place. Following are the Thailand visa requirements for Pakistani nationals. Thailand is also known as Kingdom of Thailand and one of the other name of Thailand is Siam (Thai). According to Wikipedia, the total area of Thailand is 513,120 square kilometers (198,120 sq mi). It is the 50th largest country by area and 21st most popular country in the world. In hot season, temperature range is form 28 C to 36 C and in winters, temperature drop down to 5 C or even below. The best time to visit Thailand is between November and March. Because the weather during these months is ideal/perfect. November to March is a period when most of the Thailand's festivals are celebrated. In this season, you can take full advantage of its historical, natural, and cultural sights. Bangkok is the largest city with 8.3 million population and also the capital of this country. It is famous for magnificent places, bustling markets, ornate shrines and ancient temples. You have many option by our venture Malik Express Hotel category to stay in Bangkok. The rooms are available from basic to luxury at affordable prices. You can go to Bangkok by traveling with Malik Express Travels and Tours. Chiang Mai is surrounded by mountains of northern Thailand. It has a population of 130,000 people. Chiang Mai is a flourishing city and it is famous among both backpackers and tourists. People come here to explore the lush landscapes, hill tribes and outdoor adventures. It is also a home of hundreds of Buddhist temples. It is a town in west Thailand having population of 31,000 people. It is famous for its beautiful scenery views and accessibility to national parks. It is also known for the historic Death Railway, built during WWII. It was founded in 1350, and the city of Ayuthaya is located in Chao Phraya River. Ayuthaya was an impressive site with three palaces and more than 400 hundred temples. King U Thong declared it the capital of the kingdom of Thailand. In 1767 attacked by Burmese, capital was moved to Bangkok. It is considered as the Thailand's most beautiful wildlife reserves. The Khao Sok National park covers jungle forests, limestone karsts, rivers and lakes. Railay is a small peninsula in south Thailand. This place is only accessible by boats due to high cliffs. These cliffs are center of attraction for rock climbers from all over the world. Phanom Rung is a Hindu Shrine, located near the village of Nang Rong. It was built as a dedication to Hindu God, Shiva. Pai is one of the booming town between Chiang Mai and Mae Hong Son. Due to its picturesque valley and relaxed atmosphere, it is the most favourite place of people. Chiang Rai serves as the main commercial hub of the Golden temple. The town is quite itself during the day, when most of its tourist are out on day trips, but at night it has rushy streets. The islands of Thailand are famous throughout the world for their beautiful beaches. 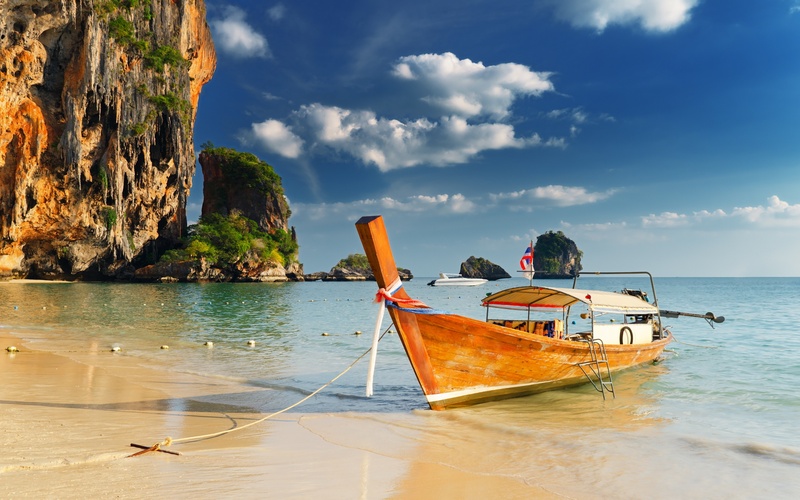 Go to Thailand Islands in a blink of an eye by booking your ticket through Malik Express. Get your Thailand visa through Malik Express, reach their by traveling with us and explore the wonders of Thailand by staying at one of our ventured hotels throughout your stay. We are glad to provide you with the information about how to get Thailand Visa. Apply for your visa now at Malik Express and get the best visa services in town. For further more queries and submission kindly visit our Contact Us page or call at our UAN 051 111 77 88 00. Do I need visa to enter in Thailand? Yes, it is mandatory for all Pakistani nationals to have visa to enter in Thailand. Is it mandatory for infants and kids to obtain a visa for Thailand? Yes; all individuals will consider as an applicant regardless of age limit, mean all travelers must need visa to enter Thailand. Am I eligible to get visa on arrival in Thailand? No, Pakistani citizens are not eligible to get visa on arrival in Thailand except from diplomatic/official passport holders. Royal Thai Embassy’s standard visa processing time is 5-7 working days. Validity of a visa is the period during which a visa can be used to enter Thailand while the period of stay is granted by an immigration officer upon arrival in accordance with the type of visa. You may apply for an extension of stay at any Immigration Office in Thailand where you may be permitted to stay for another 30-day period. You must do so before your stay permits expires, otherwise you will be fined 500 Baht for each day you overstay in Thailand.